Mr. Camacho has taught science and math in the public sectors in the Bay Area since attaining his Lifetime Secondary Teaching Credential in 1982 and his Lifetime Junior College Credential in 1985. 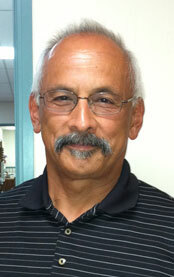 Mr. Camacho retired from Fremont Unified School District in 2011. In his 29 years of teaching, he created Chemistry curriculum at Mission San Jose High School. For his last 10 years at MSJ, he developed a curriculum for the Advanced Placement Chemistry class. His AP students consistently performed exceptionally well on the Advanced Placement Chemistry Test with passing rates in the upper 90th percentile range. Mr. Camacho was also an Adjunct Faculty Professor at Ohlone College for 14 years. There he taught varied levels of Chemistry from introductory to General Chemistry. Mr. Camacho was instrumental in developing and teaching College level curriculum in Fremont High Schools prior to the addition of Advanced Placement Classes where students who completed his class would receive college credit. Mr. Camacho has received several awards and nominations for his devotion to teaching.